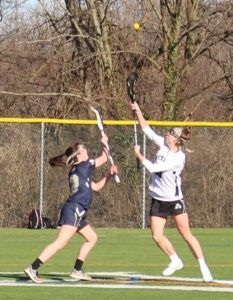 The Archmere girls' lacrosse team opened their season strong, claiming a 14-2 victory over Diamond State Athletic Conference rival Delaware Military Academy on March 26th. The number 2 ranked Auks dominated offensively from the start, scoring 11 of their goals in the first half. "The Auks scored two quick goals before the Seahawks cut it to 2-1 with 22 minutes left in the first half. The Auks won the ensuing faceoff, and Caroline Donovan scored to make it 3-1. Meghan Reilly and Dovovan scored 48 seconds apart to give the Auks a 5-1 lead with 15:17 left in the first half." They take on St. Mark's at 1:30 pm on Saturday, at St. Mark's. For full game details and pictures, click here. Photo courtesy of Jason Winchell, "The Dialog"